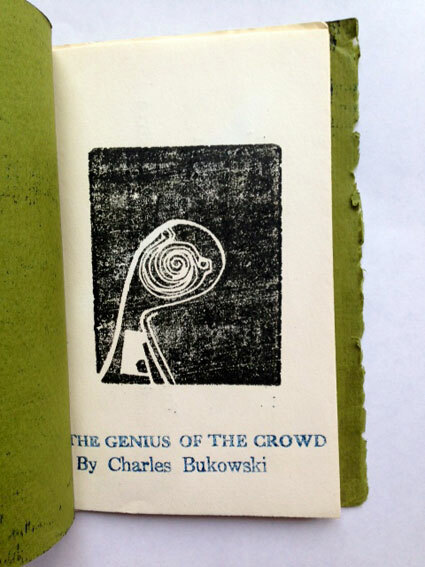 This little pamphlet is a single poem by Charles Bukowski titled The Genius of the Crowd. It’s considered by many to be his masterpiece. I’m going post the poem in its entirety. If you’re just glancing and have limited time, read it and skip the rest. It’s pretty good stuff. Afterwords, stick around and I’ll tell you the wild history of this little book and why the dealer’s asking price is $12,000. This was a cheaply-made pamphlet back 1966 by 7 Flowers Press of Cleveland. There were only 103 copies made; an extraordinarily low number. 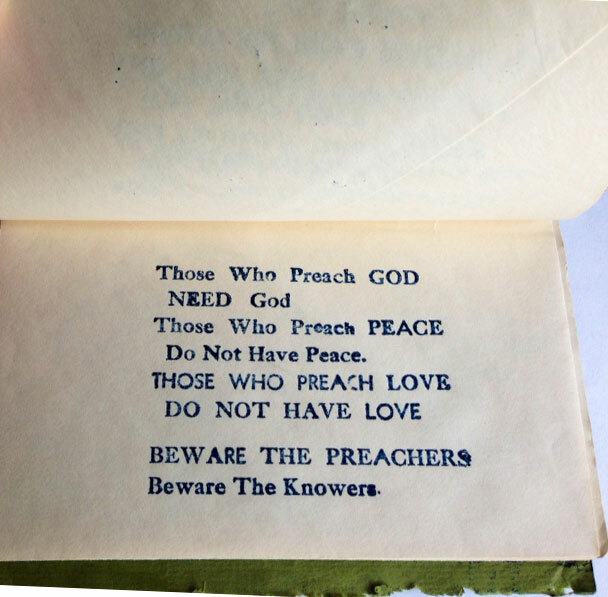 I don’t know what printing technique was used, but it looks like they may have had rubber stamps made of each text block. 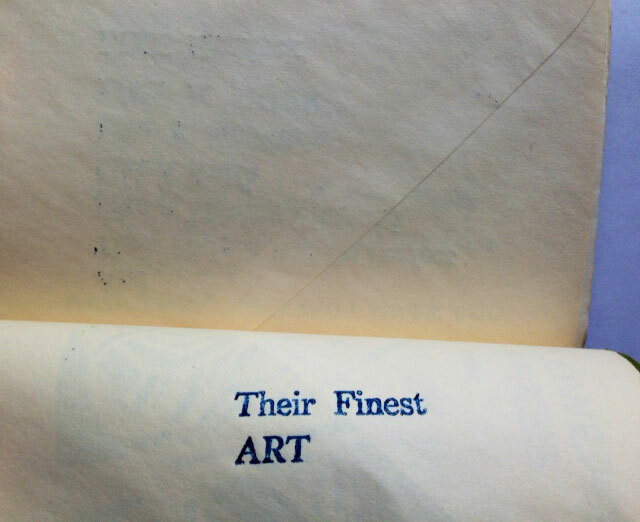 The publishers were so broke that they printed it on the back of business envelopes. If you look at the top leaf, you can see the verso of the envelope where it was sealed. These were sold by Jim Lowell at his Asphodel Books in downtown Cleveland. In the 1960’s, Asphodel Books sold radical, left wing literature. They were rabble rousers and not popular with the local politicians. One fine day, the Cleveland Police raided the bookstore on trumped-up obscenity charges, closed it down, and confiscated all of its merchandise. It wasn’t Cleveland’s finest hour. At that point, only approximately 40 copies of The Genius of the Crowd had been sold. Most of the surviving copies reside in University special collections. There are just a small handful in private hands. To this day, nobody has ever been able to locate the 63 copies that the Cleveland Police absconded with. Presumably, they rotted away in an evidence locker in the bowels of a Cleveland police precinct. The poem put Bukowski on the map and the raid by the police gave it a prescience and a special gravitas. (They will attempt to destroy/anything/that differs/from their concepts) It’s important. But $12,000? Give me a break. At auction it would probably fetch a quarter of that. Still a lot of money, but rare book dealers live in a fantasy world. Finally, here’s a recording of Bukowski reading The Genius of the Crowd with his surprisingly soft-spoken, slow, Pasadena drawl. Beautiful graphic transitions of the text in this as well. I’ve read this poem before.Late 60s, at a university writers’ meeting. There were copies of various “revolutionary tracts” and this was one.I actually kept my copy for years.It disappeared, somewhere along my travels. Bugger!But I’ll keep it this time. Thank you, sir!Is it likely a policeman recognised valuable material and hung on to a copy or three? Nah, probably not! You don’t know how many times I’ve wanted to scour the Cleveland police management records to try and locate these copies. They’re probably destroyed but, optimist that I am, I can’t help wondering if they’re somewhere in perfect, well-preserved condition. Well, call me crazy, but I don’t think $12,000 is out of line. I believe there will be a buyer for this at that price and there could even be a Bidding War! I mean, think of how rare this is—no matter how it was printed or on what—-It is so very rare and such an oddity just because of how and on what it was printed. 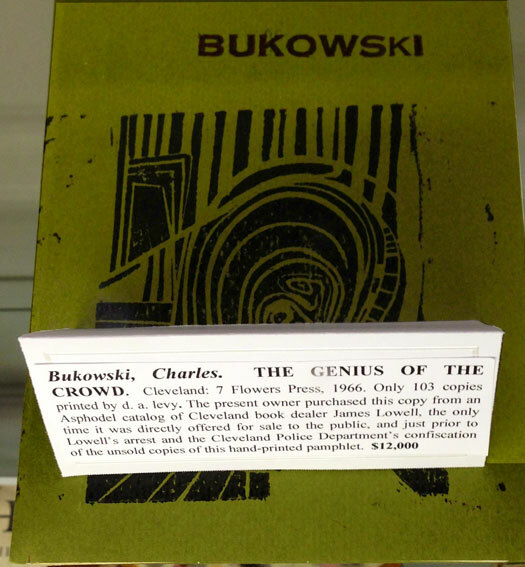 Someone who loves Bukowski and who has the money will by this. Well, this is my belief, anyway. Is it worth that? It IS to that “true collector” who must, must, MUST, have it. It isn’t to me, but then….I’m not that true collector. But I’m willing to bet someone out there is. I love this story and,I love hearing him speak the poem. Okay, you’re crazy! Just imagine what you could get for that $12K instead of this. You could lay your hands on signed copy of A Farewell to Arms or a first edition of To Kill A Mockingbird. Titles that are WAY more important and will retain their value longer. What a crazy game we’re playing. Who has $12K to spend on a stupid book that you can’t read because it’s too valuable?! I don’t know what happened to the “U” in the word buy….lol…..Maybe it’s with all those copies in Cleveland…..lol! I thought that was your poetic statement. No? “Beware Those Who Are ALWAYS READING BOOKS” sounds like something Chairman Mao might have said during the Cultural Revolution. People always reading books would probably be short-sighted anyway, which would lessen the threat from hand-to-hand combat. I’m glad he didn’t try to get a cheap laugh by writing “Beware the poet” – it would have ruined the tone of the piece. I’ve read this poem dozens and dozens of times and have always wondered about that stanza. Who does he mean? It seems completely out of synch with the rest of the piece. What! I read books! I’m not the enemy! I suspect he’s referring to ideologues, who are always reading books that reinforce their point of view. Excellent point. Such clear thinking from someone who picks the lice out of a friend’s head and then eats it. Bukowski, another interesting post from you, but he was not the first man to see the light after getting totally lallied in his youth. Based on that fact alone, half of Glesca should be placed on tall pedestals to be admired. An interesting poem, but am I the only one who recognises the familiar Germanic influence when it comes to speech making? Thank you, sir. It’s nice to see you again. Another successful holiday, I presume? Bukowski was, in fact German, and immigrated from Andernach when he was a child. He was raised in a strong Germanic household. You, my friend, get an A for this course. Not quite a holiday UB, more a case of preparing the way so to speak. As for Bukowski, his poem entitled ‘Freedom’ came straight from the mind of a man who knew much suffering back in the day. Intrinsic, yet unstable best describes his preamble through a moderate hell. ‘Freedom’ is ironically titled. It’s not what I have in mind when I think of being free. I’ll wager it’s not your idea of freedom, either. Indeed sir, no it is not. Poetry for the masses! I have a friend who teaches English Lit at the university level and he can’t work Buk into his class syllabus because it’s all there on the surface. There’s nothing to delve into. He thinks that’s the beauty and strength of Bukowski’s work. It’s raw accessibility. Lots of folks look down their noses at that. You know how I feel. You should ban anons IMO.When I first read it I was put off by its negativity.Listening to his reading somehow made it more acceptable. I simply delete the anons as they pop up. My site is so little-trafficked that it’s not really a problem. They don’t happen all that often. It’s the ONLY good thing about not having many readers.It’s a corrosive poem. Not a very nice message. But up until he found a measure of success in his late 40’s, Bukowski had a pretty miserable life. I can see where all the dark matter came from. I don’t necessarily agree with his sentiments, but I think they’re beautifully stated. Do you know his work? He ain’t for everyone. And I get that people think his poetry is slight. But it works for me. Netflix, Schmetflix. I OWN a copy! A document like that needs multiple viewings. Actually, that video I posted is from Born Into This. The post card is on its way. I LIKE that. A lot. Most of it is very accurate.Yeah, that’s a lot for a book, but it’s very arty and I like that about it, still, it’s a lot for a book. It’s pretty dark and I don’t necessarily agree with him but it is a nice piece. I’ve always wondered how much the back-story figured into its popularity and my own view on it. $12K. Please. Even if you had the money, you’d be nuts to pay that much. You are the teacher I always dreamt of when I was a child, still do. You know I love Bukowski, and I hadn’t read this poem, so thank you. The story is marvellous, and his reading… Oh my! If I had lots of $12Ks I’d definitely buy it, the colour of the cover alone is too seductive. And the envelopes! I was hoping you saw this post because I know you’re a fan. As I mentioned above, I think much of the appeal and luster of this piece is because of the fantastic story behind it. Part of its value is certainly the small print run, but would he dare ask $12K if it were just a chapbook without the backstory? Nay, I say. Gonna have to ship this link to The Boy, who has become quite enamored with Buk. You are a good teacher. Nice courdoroy jacket, with those goofyassed elbow patches, and i think you could pass… maybe a bowtie, too! And a pipe. And a co-ed starring at me dreamily. I’m that kind of teacher. Tell The Boy that Bukowski’s Mockingbird Wish Me Luck is a good one. Is it a food award? If it’s your place, I want a food award. Demand it, actually. No room for negotiations. Come to NYC and you can observe the masses until you’re blue in the face. I find it great sport and think that Mr. Bukowski’s assessments are a tad harsh. But he was on hard times. I’ll vote. I’ll vote!